Judith Davis (born 23 April 1955) is an Australian actress known for her work in film, television, and theatre. With a career spanning over 40 years she is commended for her versatility and is regarded as one of the finest actresses of her generation with frequent collaborator Woody Allen describing her as "one of the most exciting actresses in the world". She is the recipient of eight AACTA Awards, three Emmy Awards, two BAFTA Awards, two Golden Globe Awards and has received two Academy Award nominations. Davis is a 1977 graduate of the National Institute of Dramatic Art, where she starred opposite Mel Gibson in Romeo and Juliet. Most of Davis's stage work has been in Australia, including Piaf (1980), Hedda Gabler (1986), Victory (2004) and The Seagull (2011), but she also starred in the 1982 London production of Insignificance, for which she was nominated for the Olivier Award for Best Actress, and the 1989 Los Angeles production of Hapgood. She returned to the National Institute of Dramatic Art in 2017 to direct the play Love and Money. She went on to win the British Academy Film Awards for both Best Actress and Most Promising Newcomer for the 1979 film My Brilliant Career, two Australian Film Institute Awards as Best Actress for Winter of Our Dreams (1981) and Supporting Actress for Hoodwink (1981), and later went onto receive Academy Award nominations for A Passage to India (1984) and Husbands and Wives (1992). This making her the first Australian to receive nominations in both categories and the fourth Australian actress to receive an Academy Award nomination. Her other film roles include High Rolling (1977), Who Dares Wins (1982), Heatwave (1983), High Tide (1987), Georgia (1988), Alice (1990), George Sand in Impromptu (1991), Barton Fink (1991), Dark Blood (1993), Absolute Power (1997), Deconstructing Harry (1997), Celebrity (1998), The Man Who Sued God (2001), The Break-up (2006), Anne d'Arpajon in Marie Antoinette (2006), The Eye of the Storm (2011), To Rome with Love (2012), The Young and Prodigious T.S. Spivet (2013) and The Dressmaker (2015). Davis was born in Perth, Western Australia, and had a strict Catholic upbringing. She was educated at Loreto Convent and the Western Australian Institute of Technology and graduated from the National Institute of Dramatic Art (NIDA), Sydney in 1977. She has been married to actor and fellow NIDA graduate Colin Friels since 1984. They have two children, a son and a daughter. The relationship was briefly in the media when an argument led to a court order against Friels – however, they remained together at that time. They live in the Sydney area of Birchgrove, New South Wales. After making her feature film debut in the 1977 buddy comedy High Rolling, Davis first came to prominence for her role as Sybylla Melvyn in the coming-of-age saga My Brilliant Career (1979), for which she won BAFTA Awards for Best Actress and Best Newcomer. Davis was particularly praised for her performance; Janet Maslin of The New York Times admired her for bringing "an unconventional vigor to every scene she's in, even in a film that's as consistently animated as this one," while Luke Buckmaster, writing for The Guardian in 2014, opined that Davis gave "a rousing performance as bull-headed protagonist Sybylla Melvyn. The term “once in a lifetime” tends to be slapped around like a bumper sticker, but this meaty role lives up to the accolade." Her breakthrough success continued with lead roles in the Australian New Wave classics Winter of Our Dreams, as a waif-like heroin addict, the drama Heatwave, as a radical tenant organizer, and the thriller Hoodwink, as a sexually-repressed clergyman's wife. Of her performance in Winter of Our Dreams, Roger Ebert noted, "Davis brought a kind of wiry, feisty intelligence to My Brilliant Career, playing an Australian farm woman who rather felt she would do things her own way. She's wonderful again this time, in a completely different role as an insecure, distrustful, skinny street waif. [She] performs her movement magnificently." Her international film career began in 1981 when she played the younger version of Ingrid Bergman's Golda Meir in the television docudrama A Woman Called Golda, a role for which she was nominated for a Primetime Emmy Award for Outstanding Supporting Actress – Miniseries or a Movie, followed by the role of a terrorist in the controversial British film Who Dares Wins (1982). In 1984, she was cast as Adela Quested in David Lean's final film A Passage to India, an adaptation of E. M. Forster's novel, for which she was nominated for an Academy Award for Best Actress. The film became a critics' favourite, opening to tremendous praise worldwide and Variety praised Davis for having "the rare gift of being able to look very plain (as the role calls for) at one moment and uncommonly beautiful at another. Likewise, The Washington Post wrote, "With makeup the color of smudged ivory, her pallor enhanced by the off-white linens she wears, Davis is daringly unattractive for a leading lady; that plainness is emphasized in the book. Davis' neuroticism, her way of twitching and thrusting her jaw and looking up hungrily beneath the brim of her straw hat, brings to life the ravenous sexuality beneath Miss Quested's decorous exterior." She returned to Australian cinema for her next two films, Kangaroo, as a German-born writer's wife, and High Tide, as a foot-loose mother attempting to reunite with her teenage daughter who is being raised by the paternal grandmother. Her performance in the latter won her glowing praise: Pauline Kael called Davis "a genius at moods" and wrote, "As one of three backup singers for a touring Elvis imitator, Judy Davis is contemptuous of the cruddy act, contemptuous of herself. The film's emotional suggestiveness makes it almost a primal woman's picture: Judy Davis has been compared with Jeanne Moreau, and that's apt, but she's Moreau without the cultural swank, the high-fashion gloss. She speaks to us more directly." She won additional Australian Film Institute Awards for both roles, and a National Society of Film Critics award for High Tide's brief American theatrical run. Her final film of the decade, the Australian thriller Georgia, saw her play dual roles, a mother, Georgia, and her daughter Nina. For her performance, Davis earned another Australian Film Institute nomination for Best Actress. In 1990, she had a cameo in Woody Allen's Alice; this would be her first appearance in an Allen-directed film. The following year, she was featured in Joel Coen's Barton Fink, which won the Palme d'Or at the Cannes Film Festival and in David Cronenberg's adaptation of the hallucinogenic novel Naked Lunch. She returned to E. M. Forster territory in Where Angels Fear to Tread and won an Independent Spirit Award for her work as mannish woman author George Sand in Impromptu, a romantic period drama with Hugh Grant as her consumptive lover, Frédéric Chopin. Davis was especially lauded for her performance as Sand, and Hal Hinson of The Washington Post wrote, "Judy Davis makes her entrances as if she were straddling a cyclone. She doesn't just walk in, she blows in on a torrent of extravagant self-assurance and wild temperament. Sand, who's the locus of this blissfully high-spirited romp about the circle of writers and musicians in 1830s Paris, never does anything halfway; her life is an experiment in full-throttle, passionate immersion, and that's why Davis is the ideal actress for the part. She's the most atmospheric of actors, perhaps the only one around capable of streaking the screen with lightning." She earned an Emmy nomination and her first Golden Globe Award for Best Actress – Miniseries or Television Film for her portrayal of a real-life Second World War heroine Mary Lindell in the CBS Hallmark Hall of Fame presentation One Against the Wind. Adrian Turner of Radio Times noted of her, "Judy Davis, one of the greatest and least "starry" actresses around, plays Lindell and shows the same sensivity that she brought to her role in A Passage to India." In 1992, she played a major role in Woody Allen's Husbands and Wives as Sally Simmons, one half of a divorcing couple. Husbands and Wives was met with critical acclaim, and Davis's performance drew high praise. Vincent Canby of The New York Times wrote, "Sally must be one of the most endearingly impossible characters Mr. Allen has ever written, and Ms. Davis nearly purloins the film" and Todd McCarthy of Variety opined that Davis revealed "a whole new side to her personality that has never surfaced onscreen before." For this performance, she earned both Oscar and Golden Globe nominations for Best Supporting Actress. She next co-starred with Kevin Spacey in the 1994 comedy film The Ref, portraying a married couple whose relationship is on the rocks, with Denis Leary playing a thief who counsels their marriage. Roger Ebert called Davis "naturally verbal" and praised her for being able to "develop a manic counterpoint" in her arguments with Spacey "that elevates them to a sort of art form." Similarly, Rolling Stone magazine's Peter Travers found Davis "combustibly funny, finding nuance even in nonsense." Considered "one of the fiercest film actors around," Davis' other roles have included the mysterious, schizophrenic mother of a teenager in boarding school in On My Own (1993), the lifelong Australian Communist Party member reacting to the downfall of the Soviet Union in Children of the Revolution (1996), two more Allen films, Deconstructing Harry (1997) and Celebrity (1998) and a highly-strung White House chief of staff in Absolute Power (1997). After appearing in Celebrity, The Guardian newspaper wrote that Davis "in recent years has succeeded Diane Keaton and Mia Farrow as Allen's misfit muse." Much of her work in the late nineties had been on television, where she has a collection of Emmy Award nominations. She won her first Emmy for portraying the woman who gently coaxes rigid militarywoman Glenn Close out of the closet in Serving in Silence: The Margarethe Cammermeyer Story, with subsequent nominations for her repressed Australian outback mother in The Echo of Thunder (1998), her portrayal of Lillian Hellman in Dash and Lilly (1999) and her frigid society matron in A Cooler Climate (1999). Davis earned a second Emmy for her portrayal of Judy Garland in the 2001 television biographical film Life with Judy Garland: Me and My Shadows. In 2003, she earned another Emmy nomination for her interpretation of Nancy Reagan in the controversial biopic The Reagans. In July 2006, she received her ninth Emmy nomination for her performance in the television film A Little Thing Called Murder. Her tenth nomination came in 2007 for Outstanding Supporting Actress in the U.S. miniseries The Starter Wife for which she was awarded the Emmy. In August 2007, she appeared opposite Sam Waterston in an episode of ABC's anthology series Masters of Science Fiction. She appeared on the TV mini-series Diamonds from 2008–2009. In film, she continued to earn good notices for her supporting roles in Swimming Upstream (2003), as a working-class mother, and in the 2006 films The Break-Up and Marie-Antoinette. In 2011, Davis appeared as Jill Tankard in a television drama film, Page Eight, for which she was nominated for an Emmy. She played Dorothy de Lascabanes in The Eye of the Storm, an adaptation of Patrick White's novel of the same title, for which, in 2012, she won the Australian Film Institute Award for Best Actress in a Leading Role. She also had a major role as Woody Allen's psychiatrist wife in his To Rome with Love. In 2013, Davis co-starred with Helena Bonham Carter and Callum Keith Rennie in The Young and Prodigious T.S. Spivet. She reprised her role of Jill Tankard in 2014's Salting the Battlefield. She costarred with Kate Winslet in The Dressmaker, for which she won an AACTA Award for Best Supporting Actress in 2015. Although the film received mixed reviews, Davis's supporting performance was lauded by critics: Richard Ouzounian of The Star called her "sublime" and Justin Chang of Variety wrote, "Davis, whose performance here as a booze-swilling, dementia-addled and infernally sharp-tongued old matriarch is enough of a hoot to make one further wonder what she might have done with the role of Violet Weston in August: Osage County, onscreen or onstage." In 2017, Davis received a Primetime Emmy nomination for her supporting performance as gossip columnist Hedda Hopper in Ryan Murphy's anthology television series Feud. The following year, Davis co-starred with Aaron Pederson in the six-part ABC TV Series, Mystery Road. 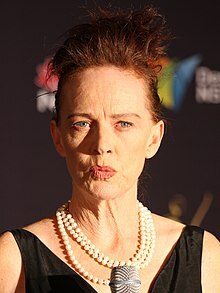 Davis's performance as the local police sergeant was praised, and The New York Times wrote, "The thing that really sets Mystery Road apart is the actress who signed on to play the outback sergeant Emma James: the great Judy Davis, playing a police officer for the first time in her career and starring in an Australian TV series for the first time in nearly 40 years. Ms. Davis is so firmly identified in the American mind with intense, often neurotic city-dwelling characters that it takes an episode or two to get used to her climbing in and out of a police car in the dusty, empty landscapes, wearing a baggy blue uniform that swallows her tiny frame. It seems at first as if she might not be right for the part, but eventually you see that she’s perfect. James is a formidable woman stuck in the middle of nowhere because of the bonds of family and history, and Ms. Davis’s preternatural intelligence and tightly capped energy serve her well." In January 2019, it was announced that Davis will star in the upcoming Netflix drama series Ratched. Davis's stage work has been mostly confined to Australia. Early in her career, she played Juliet opposite Mel Gibson's Romeo. In 1978, she appeared in Visions by Louis Nowra at the Paris Theatre Company in Sydney. In 1980, she portrayed French chanteuse Edith Piaf in Stephen Barry's production of the Pam Gems play Piaf at the Perth Playhouse. She played both Cordelia and the Fool in a 1984 staging of King Lear by the Nimrod Theatre Company, and also starred in its productions of Strindberg's Miss Julie, Chekhov's The Bear, Louis Nowra's Inside The Island and, in 1986, the title role of Ibsen's Hedda Gabler for the Sydney Theatre Company. In 2004, she starred in and co-directed Howard Barker's play Victory, as a Puritan woman determined to locate her husband's dismembered corpse. Other stage directorial efforts include Sheridan's The School For Scandal and Barrymore by William Luce (all three for the Sydney Theatre Company). She created the role of The Actress in Terry Johnson's Insignificance at the Royal Court in London, receiving an Olivier Award nomination, and appeared in a brief 1989 Los Angeles production of Tom Stoppard's Hapgood. Writing for Philadelphia magazine, David Fox found her "marvelous in the title role, as charismatic and commanding on stage as she is in film." In 2011, she portrayed the role of fading actress Irina Arkadina in Anton Chekhov's The Seagull at Sydney's Belvoir St Theatre. Paul Chai of Variety praised her performance as Irina, writing, "Davis manages to instill Irina with not only a diva’s haughty air and crafty manipulation but also with the right hint of fragility, as evidenced in her concern about being upstaged by the youthful and beautiful Nina." 1994 The Ref Caroline Chasseur Also released as "Hostile Hostages"
^ Peter Biskind. "Gods and Monsters: Thirty Years of Writing on Film and Culture". Google Books. Retrieved 14 July 2017. ^ "Judy Davis For The Eye of the Storm". Asia Pacific Screen Academy. ^ "Judy Davis, Inspiring 'Brilliant Career's 30 Years Later". N.P.R. ^ Maslin, Janet (22 February 1980). "New Face: Judy Davis Don't Call Her Sybylla; A Last-Minute Replacement 'I'm Not Good at Reading Scripts' Elizabeth Swados at Club". The New York Times. Retrieved 7 May 2010. ^ Rovi, Hal Erickson. "Judy Davis Biography". TV Squad. Retrieved 10 October 2010. ^ "Judy Davis: 'I never wanted celebrity'". ^ a b c Ryan Gilbey (25 April 2013). "Judy Davis: 'I never wanted celebrity'". The Guardian. Retrieved 2 May 2013. ^ a b "Judy Davis In Oscar Nominees". Canberra Times. 8 February 1985. Retrieved 18 November 2018. ^ Maslin, Janet (6 October 1979). "Film: Australian 'Brilliant Career' by Gillian Armstrong:The Cast". New York TImes. Retrieved 20 September 2018. ^ "Judy Davis wins U.S. film award". Canberra Times. 12 January 1989. p. 3. Retrieved 18 November 2018. ^ a b c Wuntch, Phillip (12 April 1994). "Intelligence as well as wit". Canberra Times. p. 15. Retrieved 18 November 2018. ^ Koltnow, Barry (25 September 1994). "Judy Davis writes her own script". Canberra Times. p. 25. Retrieved 18 November 2018. ^ Hinson, Hary (3 May 1991). "'Impromptu' Review". The Washington Post. Retrieved 12 December 2018. ^ Turner, Adrian (2018). "Review: 'One Against the Wind - review'". Radio Times. Retrieved December 12, 2018. ^ Canby, Vincent (September 18, 1992). "Review/Film -- Husbands and Wives; Fact? Fiction? It Doesn't Matter". The New York Times. Retrieved September 19, 2015. ^ McCarthy, Todd (August 26, 1992). "Review: 'Husbands and Wives'". Variety. Retrieved September 19, 2015. ^ Ebert, Roger (11 March 1994). "The Ref". Chicago Sun-Times. Sun-Times Media Group. Archived from the original on 4 October 1999. ^ Travers, Peter. "The Ref". Rolling Stone. ^ "ER, Frasier success outshines dull ramblings by Emmy host". Canberra Times. 12 September 1995. p. 8. Retrieved 18 November 2018. ^ Bernard Weinraub (10 December 2000). "The Rewards And the Risks of Playing an Icon". The New York Times. Retrieved 3 May 2013. ^ Frater, Patrick (9 December 2015). "'Mad Max,' 'Dressmaker' Split Australia's AACTA Awards". Variety. Retrieved 18 November 2018. ^ "Screening at TIFF Tuesday, Sept. 15: The Dressmaker, Room, Sleeping Giant". Retrieved 15 September 2015. ^ "Toronto Film Review: 'The Dressmaker'". Retrieved 15 September 2015. ^ "The New York Times: 'Mystery Road' TV Review". Retrieved 12 December 2018. ^ Kerry O'Brien (9 August 1999). "Judy Davies takes on directing". ABC 7.30 report. Retrieved 3 May 2013. ^ "13th Moscow International Film Festival (1983)". MIFF. Archived from the original on 7 November 2013. Retrieved 2013-01-31. ^ a b "6th Annual SAG Awards Nominees". Screen Actors Guild Awards. Archived from the original on 23 January 2010. Retrieved 23 January 2010. ^ "The Starter Wife – Character Profiles & Bios – Judy Davis as Joan McAllister". USANetwork.com. NBC Universal. Archived from the original on 23 January 2010. Retrieved 23 January 2010.